It wasn’t the first time children wept in front of the LA Unified school board or told horrifying tales of being bullied in school or recalled that spark of hope ignited by a remarkable teacher. But something in the way students from Los Angeles Big Picture High School on Tuesday pleaded to save their school struck a nerve with the board, which must approve a charter renewal for the school to remain open. Big Picture is a downtown high school that attracts students with difficult family and social situations and tailors instruction to accommodate their psychological and emotional needs within the curricula. One student told the board she had lived in 14 different foster homes. Another said home life was so chaotic that school was the lone stabilizing force in his life. After hearing these and other stories from a dozen of the charter school’s students and educators, the board voted to delay action on a recommendation by the Charter Schools Division to close down the school in June. Putting it off gives Big Picture leaders and district officials a three-week window to devise a strategy for keeping the tiny downtown LA school open. “I was not expecting them to be so open minded and open hearted to really hearing our students’ and parents’ stories and the extreme passion they have for this school,” Nicole Nicodemus, principal of Big Picture, told LA School Report. A district review of the charter’s operations concluded that the school not only failed to meet enrollment targets but is also losing students at an alarming rate. It currently serves only 87 ninth through 12th grade students when the charter had stipulated that more than 500 would be attending by this point. Further, the district determined that its growth plan is not viable and, at the time of the audit, the school was financially insolvent. Superintendent Ramon Cortines made no effort to sugar coat the grounds on which the district should deny the charter renewal application. “There are major financial problems with your school, and we need to deal with it,” he told school officials who had lobbied to keep the school open in its current format. A common complaint by the general public about the school board is that the seven representatives walk into meetings with their minds made up on most issues. While members may have heard from parents, students and teachers on any given issue, the impression at scheduled meetings is that many agenda items are voted on with little discussion. That is especially true on items passed by a single “consent” vote. And it’s not uncommon for public speakers to halt their remarks or even interrupt their allotted three minutes to address the board to reprimand board members for behaving like bad students: failing to make eye contact, fiddling with their phones, chatting with a colleague or giving the general appearance of not listening. But the olive branch extended by Cortines and the board reflected a willingness to “to do everything in the district’s power to welcome a charter back into the fold,” as board member Steve Zimmer told LA School Report. That’s true especially, he said, for a school offering an innovative program to serve a high-needs population despite the organizational flaws. Perhaps that is due to Cortines’s personal connection to the school, which initially launched during his second of three tours of duty at the helm of the district. “I was at your school when I was superintendent the second time,” he told Nicodemus, adding that he admired the instructional model for its approach to helping students who struggled to integrate into the traditional public school model. Big Picture was founded as part of the small learning community school movement that was supposed to help the district turn around failing schools. Later it became a Green Dot charter school until 2010, when it struck out on its own as an independent charter. But after five years, Big Picture administrators now have three weeks to come up with a new plan, one that will require more outside-the-box thinking and significant compromise. 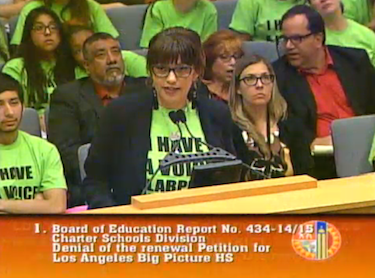 And if the school’s leaders reach a compromise with LA Unified, the school will have gone full circle.